I’m standing in the trading hall of the Lonja de la Seda (Silk Exchange) in Valencia where traders would gather from around the Mediterranean to do business. 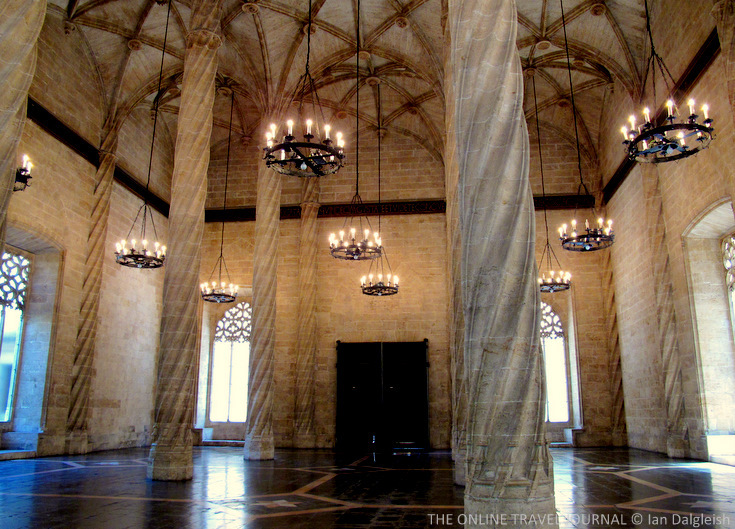 It’s an elegant, airy building; a testament to Valencia’s wealth and power as a trading city in the late Middle Ages. Naturally you look up, following the rope-like pillars to the heights of the vaulted ceiling above. The importance of the institution encouraged symbolism, the hall representing paradise and the domed ceiling the roof heaven, held aloft by a forest of palm trees. It’s a tempting image, not so fanciful even when you paint in the gold-leaf stars that once sparkled overhead. What a wonderful place to do business, I imagine merchants congregating here, from France, Italy, Northern Africa and beyond. Around the walls runs a frieze of text that served to remind traders of their duties, speaking of honesty and unbroken promises. Well, maybe not all traders had good times here, debtors it seems were dealt with in house, and had their own gaol in the adjacent tower. If you step outside into the Orange Tree Courtyard and walk up the outdoor steps in the corner you come to the the Consolat de Mar (Consulate of the Sea). It’s part of the adjoining Consulado building that completes the complex. Standing in the first floor chamber, I don’t know which is more riveting; the flamboyant Renaissance, blue and gold coffered ceiling overhead or the disorientating optical illusions created by the patterned, black, white and cinnamon coloured marble floor at my feet. Less immediately obvious and not for the faint hearted or those of delicate sensibilities, are the grotesque gargoyles that line the top of the crenelated building and adorn the arched Gothic doors and windows. Looks like the stonemason’s were having fun here, you wonder at the message behind these irreverent figures. 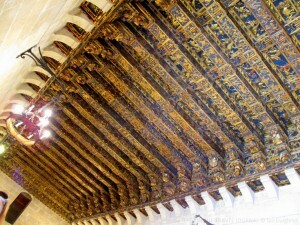 Work started on the Lonja de la Seda in 1482 under the direction of architect Pedro Compte. The Sala de Contratación trading hall and tower were completed by 1498, the Consulado and gardens being built later and not finished until 1533. As “a wholly exceptional example of a secular building in late Gothic style, which dramatically illustrates the power and wealth of one of the great Mediterranean mercantile cities”, the Lonja de la Seda was inscribed as a UNESCO World Heritage Site in 1996. 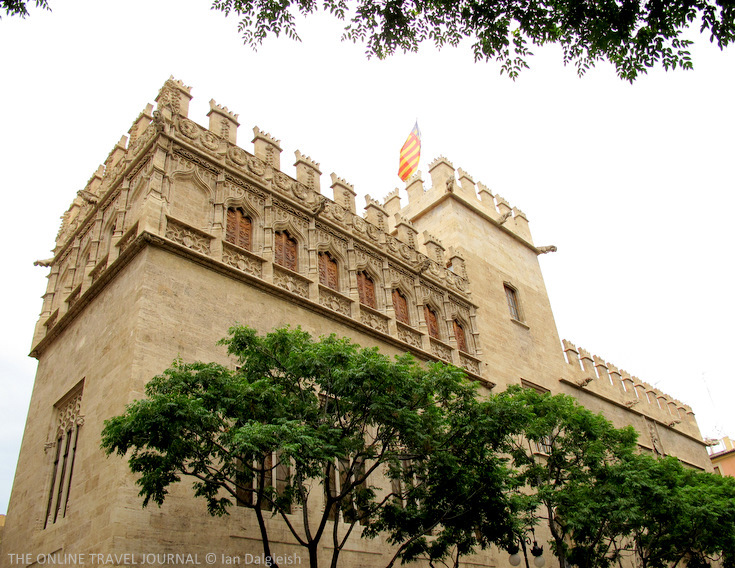 Our home base is Valencia and we used to live just up the street from La Lonja! Makes me miss Valencia a lot. Have you been there for Fallas? Fallas is our favorite festival ever!!! La Lonja is incredible. One other thing worth mentioning on it is the “Portal de los pecados” (the door of sins), between the orange tree courtyard and the main trading hall, which like the gargoyles you mention features many irreverent figurines doing various sinful acts. I believe much of the irreverence in the Lonja’s design reflected the silk merchants’ irritation with the Church, which had long frowned on many of their fiscal activities, like usury.